Together, we kindle the lights of memory and hope. Together, we welcome new members to this journey of perseverance and surprise. Together, we celebrate the songs and poems that draw us closer to freedom. Let us re-dedicate ourselves to the covenant of respect, encouragement, and challenge that keeps this community moving forward together. Today, we experienced the kindling of many flames. Hanukkah is a festival of lights. This is not to disrespect the darkness. The darkness brings us mystery. The darkness may have sheltered the Maccabees and given them an advantage in their surprise maneuvers. Sheltering, nurturing darkness has its time, for seeds and for souls and for the new moon. So, too, comes the time to kindle new flames and to illuminate a new way forward. Once the Maccabees drove out the Seleucid Greeks, they established a government of self-rule known as the Hasmonean Dynasty. This chapter in history lasted a generation before foreign powers once again invaded and traded ruling over Judah and the Temple in Jerusalem between them. Political stability is not the point of Hanukkah. Nothing temporal lasts forever. Re-dedication is the point. Every year, we renew our commitment to freedom and to observing sacred time and space, passing along these traditions like the flame of a candle. Something interesting about the Jewish calendar is that the months follow the phases of the moon. The eight days between the 25th of Kislev and the 2nd of Tevet always fall around the New Moon, the darkest nights of the month, near the winter solstice, the darkest time of the year. We light candles as we observe the deepest darkness and rededicate ourselves to the flame of freedom. On the tail end of Hanukkah, the moon is waxing again. Our Pagan friends might say it is a good time to invoke new projects. Yet we are in the middle of a lot of things. Today might not seem like a day of fresh starts and new possibilities. This is not chapter one or the final chapter, this is the middle of the story. The middle of the story needs illumination and transformation, too. In the middle of the war between the Maccabees and the Seleucid Greeks, the Jews stopped what they were doing to give thanks and to celebrate. Their victory for that war was still several years away. The extremely energy efficient oil that fueled the menorah for over a week is a pretty neat miracle, but I don’t want to overlook the miracle of people who re-dedicated their sacred space and their lives, despite the odds. This is the kind of miracle we need now. There is a lot going on in the world that troubles me. Perhaps you are troubled as well. The reasons for worry and fear come from all sides, to the point when it seems easier to burrow into lives of individual concern, forgetting for the moment that we are all connected. One might be tempted to give up on the sacred places and the life of the spirit. Why not just join the side with all the swords and the war elephants? Hope takes some effort. It is time for us to kindle the flame. We do not light a beacon by ourselves. There are movements of people working toward justice, peace, and health. There are marches and organizing meetings and fundraisers and candlelight vigils where people can build coalitions. There are ongoing efforts for coordinated compassion, places that help neighbors to feed and clothe and house and empower themselves. There are Facebook groups and Twitter hashtags and knitting projects and pen pal programs that connect people around the planet, each tending flames of hope. This, I believe, is part of what a spiritual community is for. In a congregation, we come together to lend the strength and courage we need to bear witness to justice, equity, and compassion. We create a sacred space where our individual hurts can be soothed and where we can prepare together for healing the world. Gathering up the energy to re-dedicate ourselves and our spiritual home to the practice of our values is an act of generosity that benefits people all around us. 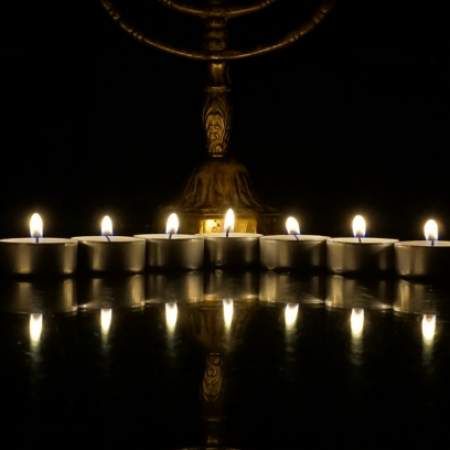 There is a tradition that suggest that the menorah lit in the evening should be visible from outside the house. This way, it becomes a public witness, a reminder to all that unlikely victories can happen, an expression of gratitude for whatever degree of freedom we enjoy, and an urging to keep going. As Fannie Lou Hamer said, none of us are free until all of us are free. Kindling a flame helps us to become more visible, to find each other in the midst of this chaotic opportunity. These flickers become a signal beam, bringing hope to those who thought their small flame was the only one. Together, we will sustain the beacon for much longer than anyone had imagined.